Following on from the success of Fractal Geometry: Mathematical Foundations and Applications, this new sequel presents a variety of techniques in current use for studying the mathematics of fractals. Much of the material presented in this book has come to the fore in recent years. This includes methods for studying dimensions and other parameters of fractal sets and measures, as well as more sophisticated techniques such as thermodynamic formalism and tangent measures. In addition to general theory, many examples and applications are described, in areas such as differential equations and harmonic analysis. This book is mathematically precise, but aims to give an intuitive feel for the subject, with underlying concepts described in a clear and accessible manner. 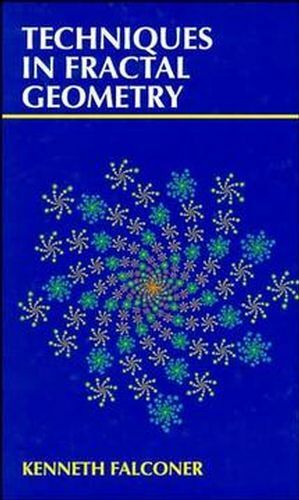 The reader is assumed to be familiar with material from Fractal Geometry, but the main ideas and notation are reviewed in the first two chapters. Each chapter ends with brief notes on the development and current state of the subject. Exercises are included to reinforce the concepts. The author's clear style and up-to-date coverage of the subject make this book essential reading for all those who with to develop their understanding of fractal geometry. About the author Kenneth Falconer is Professor of Pure Mathematics at the University of St Andrews. He was an undergraduate, research student and Research Fellow at Corpus Christi College, Cambridge, and became a Lecturer and then a Reader at the University of Bristol before moving to St Andrews in 1993. He has written three other books and many research papers, largely on fractals, geometric measure theory and convexity. Some Techniques for Studying Dimension. The Ergodic Theorem and Fractals. The Renewal Theorem and Fractals.